Order or Make Your Own! Do you remember the excitement of waking up to Chocolate Easter Eggs on Easter morning? The anticipation of the Easter basket was always a delight for me. I admit that sometimes the anticipation was greater than the actual treat, but finding chocolate was a wonderful reward regardless. By the way, have you ever wondered why we use eggs to celebrate Easter? You can discover some of the traditions and history that go along with our modern Easter celebrations. If you want to send Gourmet Easter chocolate eggs to someone you love, look at the selection available at the bottom of this page. 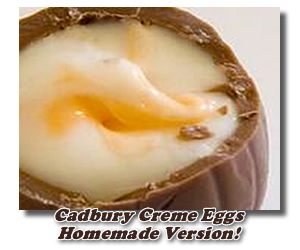 There are some fantastic options as well as the basic Cadbury creme eggs. You can even make your own with one of these chocolate Easter egg candy recipes. Make them with the help of the kids, or do them in secret and use them as a delightful surprise! Okay, I'm not going to claim this is "just like the Cadbury creme egg" but it is a nice homemade version that I think you'll find both yummy and fun. Let me know what you think once you've tried it. Combine butter, salt and vanilla and beat until fluffy. Add sweetened condensed milk, and gradually mix in powdered sugar. Blend until stiff. Dust counter with brown sugar, and knead mixture until smooth. Take about 1/3 of the mixture and add the yellow food coloring to it. Blend well. Shape yellow mixture into balls to form the "yolk" and then shape the white mixture around it to form an egg shape. Place formed eggs on paper towels and allow to dry at room temperature for about 24 hours. Melt chocolate and shortening in the top of a double boiler, stirring until melted. You could also melt it in the microwave if you stir every 30 seconds and do not overheat. Dip each egg in the melted chocolate and place on waxed paper lined tray to set. Store chocolate easter eggs in an airtight container in the refrigerator. If you'd like, these Easter eggs can be decorated with icing or candy confetti shapes. Look at the selection at Candyland Crafts. Combine cream cheese, powdered sugar, butter, and vanilla in a bowl and mix until smooth. Form mixture into egg shaped balls and place in the freezer to chill. Melt chocolate and shortening over a double boiler or in the microwave (stirring every 30 seconds) until smooth. Dip eggs in chocolate and place on waxed paper covered tray to set. Store in an airtight container in the refrigerator.Melt chocolate and dip each candy into it. Place on waxed paper to set. Whether you make your own or buy some from the gorgeous selection below, enjoy your Chocolate Candy Easter Eggs this year!